*If you happen to find yourself in any of them, some of them we can help you with, some of them we can’t. Sorry. We’ve all been there (stop lying) and it’s not pleasant. You know who it’s even worse for? The poor person sitting next to you when you unleash that stank after a long day. This one can be avoided – or at the very least minimised – so be a better human and check out our Shoe Life Hacks: Smelly Shoes Remedy video. Ok, things are going good. You’ve just been booked to model for the new Yeezy show and you know this is your big break. But then you arrive at wardrobe and…oh god…what are those?! “Am I supposed to walk in them? !” you internally scream to yourself. Yes, yes you are. Good luck with this one, we can’t help you. Those precious little monsters of yours have been really ramping up the cheek factor recently and now their shoes have developed a hole in them. Oh, a trip to a busy shopping centre whilst they moan how bored they are and terrorise other shoppers; what a great Saturday. But turn that frown upside down parent or guardian, as there’s no need to traipse into town when you have access to our How To Fit Kids Shoes video. So now you can order their replacement from our great kids’ range from the comfort of your couch, make sure they fit properly at home and take advantage of our easy returns and flexible 365 Day Returns Policy. Fear = gone. Oh my days. What an absolute drag. I mean, we really just wanted to put this gif in because it makes us laugh. Have you seen the whole video? It’s actually a piece of performance art by Melati Suryodarmo who is one of Marina Abramovic’s protégés, although the version with the Adele song put over the top is our fave (Google it). Anyway, as a general rule of thumb, just don’t go into one of those clubs that have blocks of butter on the dance floor when you have your new red high heels on. Noooo! Your Converse were looking so fresh, so crisp, so white…and now they have dirty marks all over them. Absolute. Nightmare. And the hysteria only begins to grow as you play with the idea of putting them in the washing machine but worry the hot water will melt the glue and then they’ll be wrecked for good (you would be correct to worry about this, we never ever suggest you clean them in this way). 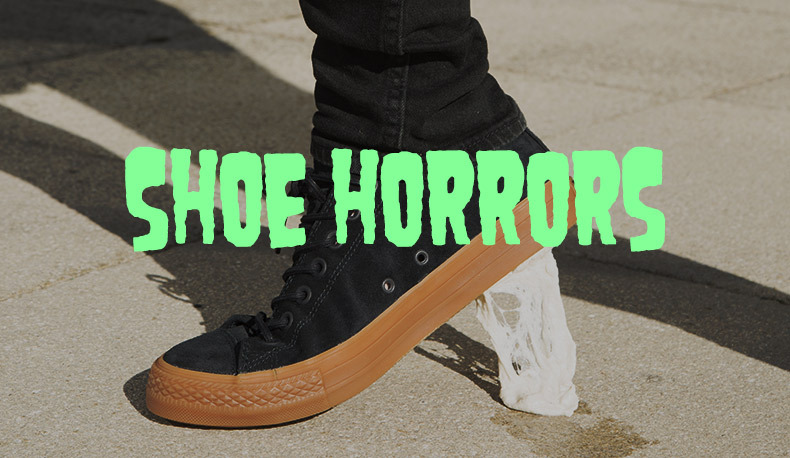 And here is where we come to your panic-stricken side with our super helpful How To Clean White Converse video. Breathe easy, my friend, it’s all going to be ok.
As for the top image, I think our mum’s used to pop our school trousers in the freezer overnight when they got under desk-attacked by chewing gum, so a pair of shoes should probably fit in there too? Or you could just use it an excuse to buy more shoes.